And now it’s 2019 and with the transition we come to that portion of the Twelve Days of Christmas that bridge us to the new year. Six days in the old and six in the new. They begin with New Year’s Day on the Seventh Day of Christmas––a traditional day for Wassailing (and I’m sorry I didn’t get the blog published in time for you to have our Wassail recipe in time for the day… but you can still make it)––and take us through to Epiphany, the day known as Little Christmas, a holyday/holiday older than Christmas itself, the day traditionally thought of as the day the Magi arrived to visit the newborn child they sought by following the star that led them to Bethlehem. I hope you know I’ve missed you! We’ve been busy preparing for that Lake Worth Cottage Tour I told you about earlier, and lots of other stuff, too. And while we are getting lots done, I have to admit I’ve rather missed spending our daily time together this Christmastide, so maybe we take a different approach again next Christmas and go back to our usual daily visit with a Convivio Book of Days post for each of the Twelve Days of Christmas. It can be difficult finding that place of balance, especially at a time of excess like Christmas. Even if I’m not writing to you each day, rest assured in my head I still am, especially as I read and research an ponder the meaning of each of these days. Here, too, at this juncture of the new year, is where following the Twelve Days of Christmas tradition can get more challenging. I get a little sad seeing Christmas trees in the trash piles on the roadside outside homes, especially this early, or reading social media posts from folks who have gotten their Christmas packed away already. December 26th was the first of those I saw this year, which I think is for me a record-breaker. And then I wonder what makes me sad about this and figure it’s my problem, not theirs, that I react this way. Everyone can keep Christmas as they want, of course. My role, as a Christmas Traditionalist, is simply to help encourage those of us who want to keep it in its traditional format. As for our house, we will keep Christmas for its full season and we will be sad to see it go. Will the greenery still be up when the Cottage Tour takes place on the 26th of January? Most likely yes. We typically keep the Christmas tree in place until Candlemas Eve at the start of February, so I imagine we will do the same this year, cottage tour or no. And to all the folks who come through our little house on the tour and might wonder about it, we’ll explain why its there. We’ve been a stop on these neighborhood historic home tours before and we’re usually known as The House with a Printing Press. This time, we may be known as The House with a Printing Press and a Christmas Tree. The one on the corner. The one that smelled of pine. Here, by the way, is your Convivio Book of Days calendar for January, a printable PDF as usual. 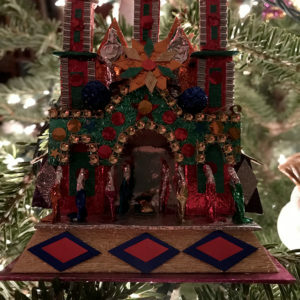 Click, print, and use the calendar as a nice companion to the blog, beginning here with these last six days of Christmas. Pour the contents of two large bottles of beer or ale (about 4 pints) into a pot and place it on the stove to heat slowly. Add about a half cup sugar and a healthy dose of mulling spices. (If you don’t have mulling spices on hand, you can use cinnamon sticks and whole cloves… though the mulling spices lend a more interesting flavor.) Add a half pint each of orange juice and pineapple juice, as well as the juice of a large lemon. Peel and slice two apples and place the apple slices into the pot, too. Heat the brew but don’t let it boil, then pour the heated wassail into a punchbowl to serve. Custom calls for us to share the wassail with those gathered but also to take the steaming punch bowl out to the orchard and toast the apple trees and share some with the oldest or biggest tree in the grove. Some folks pour the wassail on the trunk of the tree, while others dip the lower branches into the wassail bowl, and others may place wassail-soaked toast or cake in the branches of the tree. All of which are invocations of magic meant to encourage a good crop of apples next summer. Traditionally, the wassailing of the apple trees is done at the noon hour. Again, we believe you’d do best to let tradition inform your ways, but not dictate how your days go. So if your wassail happens to be late at night, there’s no harm in that. Wes Hel! Huzzah and cheers! And a happy new year to us all. We enter the more contemplative period of the Twelve Days and today, for this Eighth Day of Christmas, we remember St. Macarius, who, truth be told, was not much fun in his older years. He was an extreme ascetic who lived the life of a hermit in the desert and ate only raw vegetables and maybe, on a special day, a bit of bread dipped in oil. But earlier on in life, St. Macarius was a confectioner in his native Alexandria. Macarius the confectioner is remembered more fondly than Macarius the ascetic; he is a patron saint of cooks, confectioners, and pastry chefs, some of whom call him St. Macaroon, as Macarius does not exactly roll easily off the tongue. And so today, perhaps enjoy something a little sweet––a bit of that boozy Christmas fruitcake, maybe, or something more attuned to Alexandria––dates stuffed with nuts and rolled in sugar seem like something St. Macaroon might have made in his shop centuries ago. Francophiles, rejoice! While there are no particular customs (that I am aware of, anyway) associated with this Ninth Day of Christmas, it is St. Genevieve’s Day. Genevieve, sacred to Paris, that fair city’s patron saint, lived in Paris in the fifth century as a nun and is credited with saving the city from an attack by Attila and his Huns in 451. This she did through fasting and prayer, encouraging the residents of the city to join her. And around 475, she founded Saint-Denys de la Chapelle in Paris, which stands today as part of the Basilica of St. Denis. As the patron saint of the City of Light, I like to think of Genevieve in terms of her connection to light––as another of the midwinter saints who are light bearers at this dark time of year and who encourage us to be light bearers, too. She is often depicted holding a candle. As the story goes: the devil would time and again blow out her candle as she went to pray at night. Genevieve, however, relit her candle without need of flint or fire, always overcoming the darkness. There are plenty of you out there who love the food and culture of France. I think today, this Ninth Day of Christmas, is a fine day to enjoy those things fully. Joyeux Noël et bonne année! Again today, like yesterday, there are no particular customs associated with this, the Tenth Day of Christmas. It is the Feast Day of St. Titus and St. Gregory. Titus was a disciple of St. Paul in the first century, and St. Gregory was a bishop in the sixth century. It’s also St. Rigobert’s Day and St. Ramon’s Day. If you still have it in you to celebrate another grand event or two, well, very soon will come Twelfth Night and Epiphany. In this house, we sometimes mark these closing days of the Yuletide season quietly, and sometimes with a big meal and a gathering of family and friends. Whatever you decide, this Tenth Day of Christmas is a good one to use for preparations. With Twelfth Night and Epiphany, our focus shifts a bit toward the Magi and the star that they followed. We bring out the illuminated paper star lanterns and we make Christmas sweets that, no matter how much we try to make earlier, we never seem to get made until the last few days of Christmas. Maybe it is a subconscious decision, for these baked goods feel older, more influenced by ancient flavors, flavors the Magi were probably familiar with: Baklava flavored with honey and walnuts, our friend Paula’s Kourambiedes cookies, each studded with a clove, and our Three Kings Cakes, flavored with honey, rose water, and currants. Usually on the blog on this Tenth Day of Christmas I offer up our recipe for Three Kings Cakes with the idea that it is a very good day to bake them. Perhaps this is the best custom for the day! The recipe yields three cakes, cakes you will prepare in three loaf pans. You will end up with one cake for each of the Magi, who have traditionally been called Caspar, Melchior, and Balthasar, though no one knows who they were really. As the story goes, it took the Magi all these days to travel through the desert, and seeing the child lying in the straw was their great epiphany. We happen to sell a wonderful rose water made at the Sabbathday Lake Shaker Community in Maine. If you’re local and you need some to bake these cakes, let me know and together we’ll find a way to get you a bottle in time, even if it means meeting up in a parking lot somewhere! Preheat oven to 300 degrees. Cream together the butter and the sugar, then add the eggs and vanilla. Beat smooth before adding the remaining ingredients. Grease 3 loaf pans (about 8″ x 4″ x 3″ or so) and divide the batter amongst the pans. Bake for one hour, or until a toothpick poked into the center of each cake comes out dry. Let the cakes cool in their pans on a rack. Once the cakes are baked, combine the syrup ingredients, except for the rose water, in a saucepan over medium heat. Once the sugar dissolves, add the rose water. Remove the cinnamon stick and the cloves and then pour the hot syrup over the cakes in their pans, divided equally amongst the three cakes. The syrup will soak into the cakes. Allow to cool completely before unmolding from the pans. Serving the three cakes on three platters makes for a nice presentation on Epiphany Day or on Twelfth Night. Twelfth Night used to be a really big deal. In England, it was once a celebration rivaling that of Christmas Day. Queen Victoria, however, had the holiday stricken from the calendar during her reign, as she disapproved of its rowdiness and thought her subjects would be better off without Twelfth Night. Her disapproval had a major impact on the celebration and it practically died out. We are, I’d say, the poorer for this. Ever the champion of the underdog, I am here in my role as a Christmas Traditionalist to champion Twelfth Night, for it can be a very useful holiday, no matter what Old Queen Victoria thought of it. If you are inclined to feelings of melancholy or disappointment after Christmas Day has passed, these Twelve Days––and especially Twelfth Night and Epiphany, which provide a proper send-off to the season––are just what’s needed to help get you through that. For all we talk about maintaining links to the past, perhaps it is this, more than anything, that offers the best reason behind keeping an obscure old holiday like Twelfth Night in our contemporary world. Twelfth Night helps us feel more rounded, more complete. This is the value of Twelfth Night. Years later, after my first internship at the Shaker Press, Brother Arnold Hadd and I exchanged so many letters. In one of those letters, that winter that followed my internship, he wrote about the Shakers’ Christmas celebration. It included things like “shaking the tree” (for presents, I think) and their tradition of a Swedish smörgåsbord (this, a tradition handed them by Brother Ted, who I never did meet), and yes, Twelfth Night. There is some confusion about when Twelfth Night actually falls, but I trust the Shakers on this. They celebrate on the evening of the this day, the Eleventh Day of Christmas. I think the confusion comes out of the way we reckon our days now as opposed to the way our ancestors reckoned theirs. Traditionally, the start of a new day begins at sundown. This is why so many evenings before holidays are so important. Think of Halloween (the Eve of All Hallows) or Christmas Eve. There is a scene in The Bishop’s Wife where Cary Grant’s character convinces Mildred, the bishop’s secretary, to leave work and let him take care of typing the bishop’s sermon. “It’s almost Christmas Eve,” he tells Mildred. “You must have shopping to do.” It’s the afternoon of the 24th when he tells her this. Even then, just 70 years ago when this film was made, there was a general understanding that Christmas Eve began once the sun went down and that was the ushering in of Christmas. As for Twelfth Night, the Shakers believe (as do I) that Twelfth Night ushers in the Twelfth Day of Christmas. As such, it begins with the setting sun on the 5th of January. Twelfth Night has, as well, another name: Eve of the Epiphany. So the traditional English Twelfth Night was a fun filled party with, no doubt, lots of ale and cider and punch, lots of food, and music, dancing, and games. When I picture a Twelfth Night party in my head, it looks a lot like the party that Old Fezziwig throws for his employees in Charles Dickens’ A Christmas Carol. It is, alas, not much celebrated here in the States. Inspired by our Shaker friends, though, we’ve hosted a few Twelfth Night dinners in the past. That, I think, is a good start. In Italy, la Befana will make her rounds tonight, and in Latin America, los Tres Reyes, the Three Kings, will be doing the same. All of them will be delivering gifts; they are the last of the Midwinter gift bearers. Their stories are intertwined. Epiphany––a celebration older even than Christmas itself––marks the day the Magi arrived after their long journey, following that star, to see the child born in a barn. They arrived with gifts for the child, and so it is no surprise that they are amongst our Midwinter gift bearers. In Italy, though, the legends get a little more interesting, wrapped up as they are with a kindly old witch. There, it is said that the Magi stopped at la Befana’s and asked her for directions and to join them on their journey. They found her sweeping her floor. “No, no,” she told them, “I’m too busy with my housework!” And so the Magi went on their way. But as she swept, la Befana grew remorseful that she had not gone with them, and so she stopped her sweeping, hopped on her broom, and left her home in search of the Magi and the child. But she never found them. Each year on the Eve of the Epiphany, she sets out on her journey again, in search of the child, delivering small presents to good boys and girls, and coal for the not so good ones. I have known lots of Befanas in my day. It comes with the territory when you are of Italian descent. Women and men who clean and clean and clean, and who take great pride in their clean homes. Which is a wonderful thing, of course, but you know that they would’ve said no to the Magi, too, just like la Befana herself did at that first Christmas. Where does she even come from, la Befana? Well, she is an old hag… and so is the earthly goddess at Midwinter in the circular nature of the year: Born in springtime, fair maiden in summer, mother in autumn, old woman in winter. A cycle repeating with each orbit around the sun, the story told again and again. And then there’s something else, something I mentioned last year at Twelfth Night, too: My father is gone these two Christmases now. It’s no easier, to be honest. We are all aware that Dad is not at the table and there have been a few days this season where I’ve been plain sad and melancholy, a feeling that comes and goes all through the year. There is another tradition for Twelfth Night, in which the Yuletide decorations are taken down. This, too, makes me a little melancholy. In case you haven’t noticed, I am a bit in love with Christmas. There is much about our celebration these days that is grating and irksome, but Seth and I, we do a very good job of keeping these things at bay, leaving to the best of our abilities only what is pure and essential. And so Christmas is in this little home a truly extraordinary time––a time outside ordinary time––and it does make us sad to see it go. 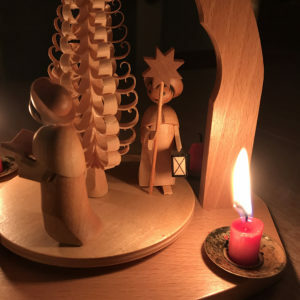 Many years we follow the older tradition I mentioned at the start of this blog chapter: it is the more ancient view that Christmas and Yuletide run all the way to Candlemas Eve, the First of February. This is an idea that is more aligned with the planet’s natural rhythm, for with Candlemas we reach the next cross-quarter day after the Midwinter Solstice. With it, the earth shifts toward spring, for winter is then beginning to wane: astronomically, we’ll be, at that point, halfway between the solstice and the spring equinox. Our ancestors enjoyed their Yuletide greenery all the way to Candlemas but not beyond… keeping it in the house any later than the First of February was an invitation for bad luck. So for us, most likely, our Yuletide greenery will be up til then. Seth and I like it that way, and Haden the Convivio Shopcat seems to like it that way, too. And so be it. On this final day of the Christmas season, we come to a celebration that was recognized by the Church even before Christmas itself. It is the day tradition tells us the Magi reached the stable to visit the child after their journey following the star that guided them to Bethlehem. Seeing the child was their epiphany, and that is the name of this day, too: Epiphany. In our home, we close the celebration of Christmas on Epiphany night with a simple ceremony at the front door, outside on the front porch. We will gather up all who are in attendance and we will each take turns writing with chalk on the lintel above the front door the numbers and letters and symbols of a traditional inscription. This year, it will read as follows: 20+C+M+B+19. These are the initials of each of the Three Kings (C for Caspar, M for Melchior, B for Balthasar), punctuated by crosses, blanketed on either side by the year. For me, the inscribing is always accompanied by a silent prayer that no one will be missing when we gather next to write the inscription again. Depending on the weather, the inscription may be there above the door for a month or it may be there all the year through. And though Christmas be gone, still the inscription reminds us of its presence as we pass each day through that portal. The inscription is a magic charm of sorts, protecting the house and those who pass through that doorway, harboring the goodwill and spirit of Old Father Christmas. And with that, these Twelve Days of Christmas are done. La Befana is back to her sweeping, sweeping Christmas away, too, and we return to ordinary time, back to the workaday world. There will be some celebratory days to mark that transition when it comes… and you’ll hear from me once again when they arrive. Til then: May the spirit of Christmas be with you still. 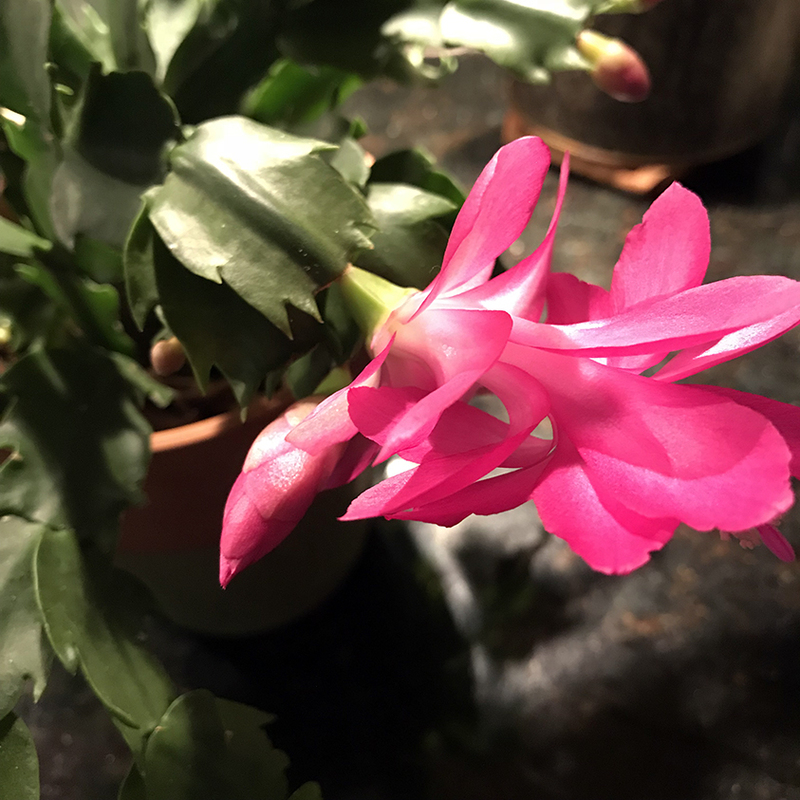 Image: Our Christmas Cactus, with its impeccable timing, came into bloom just this past week. Twelfth Night used to be a really big deal, a celebration rivaling that of Christmas Day. Ever the champion of the underdog, I am here today to champion Twelfth Night, too. If you are inclined to feelings of melancholy or disappointment after Christmas Day has passed, these Twelve Days––and especially Twelfth Night and Epiphany, which provide a proper send-off to the season––are just what’s needed to help get you through that. For all we talk about maintaining links to the past, perhaps it is this, more than anything, that offers the best reason behind keeping an obscure old holiday like Twelfth Night in our contemporary world. Twelfth Night helps us feel more rounded, more complete. This is the value of Twelfth Night. In Italy, la Befana will make her rounds tonight, and in Latin America, los Tres Reyes, the Three Kings, will be doing the same. All of them will be delivering gifts; they are the last of the Midwinter gift bearers. Their stories are intertwined. Epiphany––a celebration older even than Christmas itself––marks the day the Magi arrived after their long journey, following that star, to see the child born in a barn. They arrived with gifts for the child, and so it is no surprise that they are amongst our Midwinter gift bearers. In Italy, though, the legends get a little more interesting, wrapped up as they are with a kindly old witch. There, it is said that the Magi stopped at la Befana’s and asked her to join them on their journey. They found her sweeping her floor. “No, no,” she told them, “I’m too busy with my housework!” And so the Magi went on their way. But as she swept, la Befana grew remorseful that she had not gone with them, and so she stopped her sweeping, hopped on her broom, and left her home in search of the Magi and the child. But she never found them. Each year on the Eve of the Epiphany, she sets out on her journey again, in search of the child, delivering small presents to good boys and girls, and coal for the not so good ones. Closer to home, it’s not been the happiest Christmas for us, after losing my dad in February. I’d say all of us in my family are all doing well, but we are all aware, too, that Dad is missing and there have been a few days this season where I’ve been plain sad and melancholy. There is another tradition for Twelfth Night, in which the Yuletide decorations are taken down. This, too, makes me a little melancholy. In case you haven’t noticed, I am a bit in love with Christmas. There is much about our celebration these days that is grating and irksome, but Seth and I, we do a very good job of keeping these things at bay, leaving to the best of our abilities only what is pure and essential. And so Christmas is in this little home a truly extraordinary time––a time outside ordinary time––and it does make us sad to see it go. Many years, and this may very well be one of them, we follow another, even older tradition: the idea that Christmas and Yuletide run all the way to Candlemas Eve, the First of February. This is an idea that is more aligned with the planet’s natural rhythm, for with Candlemas we reach the next cross-quarter day after the Midwinter Solstice. With it, the earth shifts toward spring, for winter is then beginning to wane: astronomically, we’ll be, at that point, halfway between the solstice and the spring equinox. Our ancestors enjoyed their Yuletide greenery all the way to Candlemas but not beyond… keeping it in the house any later than the First of February was an invitation for bad luck. If you are celebrating Twelfth Night, or if you have memories of celebrating in days past, please tell us about it by leaving a comment below. I hope you are. It is our chance to send Old Father Christmas on his way in style. He deserves as much as that, no? 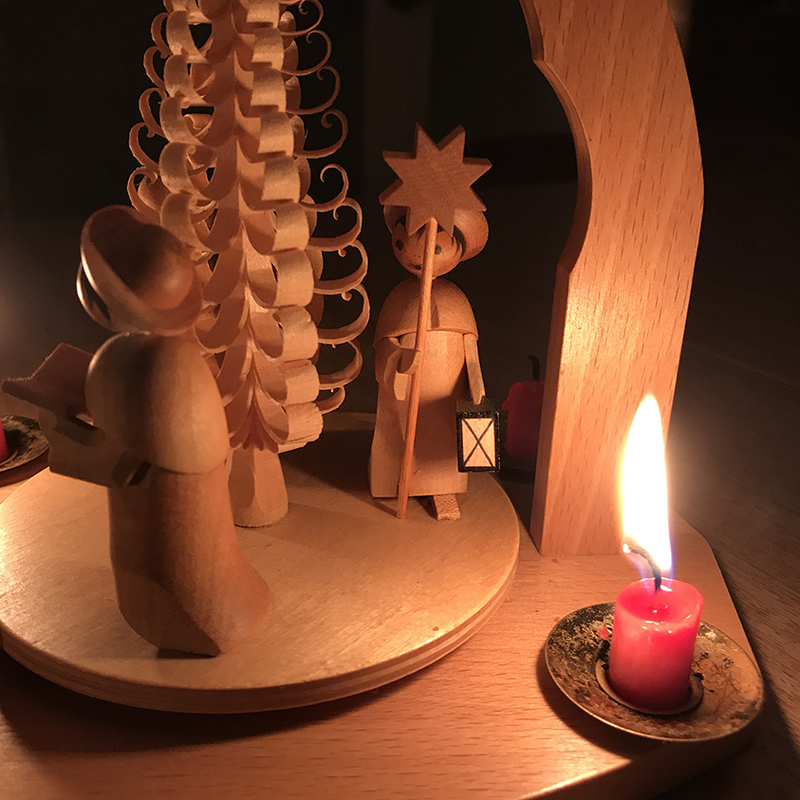 Image: Christmas pyramids from Germany’s Erzgebirge region can be quite elaborate, but ours is a simple one, featuring three carolers, one of them holding a traditional caroling star. Singing round the star was a common Twelfth Night practice though Northern Europe centuries ago. I hope it still is.